In our clinic, Lokomat training is integrated in the rehabilitation plan of our patients and combined with the conventional therapy plan. In this case report, we describe how the Lokomat was used in our center to support the recovery of a severely affected stroke patient. We illustrate how the Lokomat can become part of the standardized therapy to improve walking ability and functional independence. Our patient for this case report is a 48-year-old woman who suffered a hemorrhagic stroke during a yoga session in March 2014. The initial assessment revealed a subcortical nontraumatic intracerebral hemorrhage in the left hemisphere (ICD code I61.0). When admitted to the hospital she had hypertension, total aphasia and disturbance of conciousness. Before the stroke the patient had been healthy and active. The patient’s initial Glasgow Coma Scale (GCS) score was 12; in the ER after Computerized Tomography, it was reduced to 7. She needed intubation at an initial stage and was in acute care for three months. After this initial period, she was referred to our center for intensive rehabilitation. Upon admission to our center, the patient showed severe right hemiparesis and associated cognitive deficits. She was classified as a severe patient according to Pereira et al. 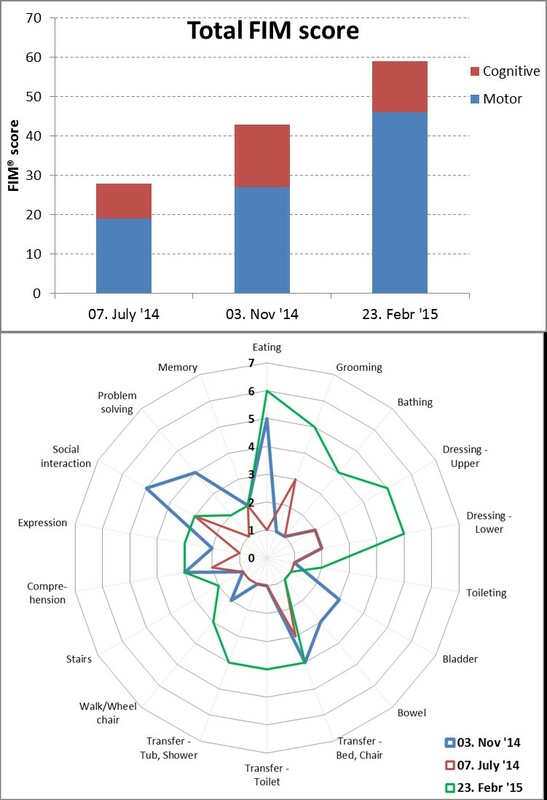 2013, with a Functional Independence Measurement (FIM) score of 28 (19 motor + 9 cognitive). 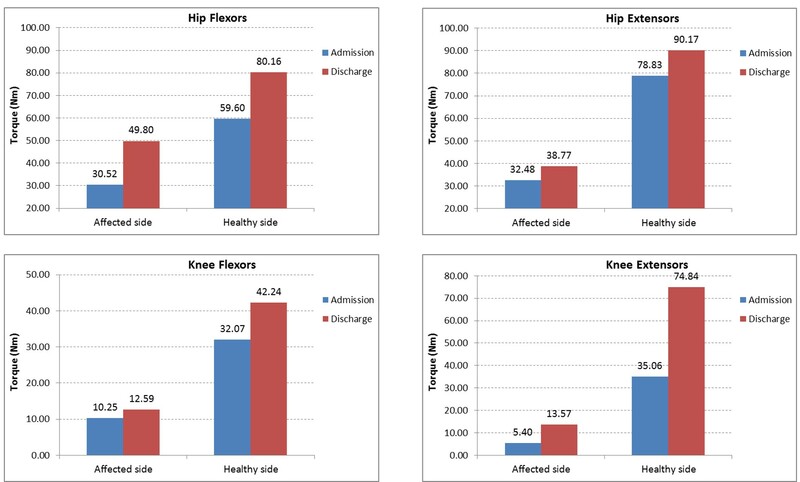 Motor function was assessed with the Lokomat assessment L-FORCE for hip and knee flexors and extensors for both the affected and unaffected side (see graph below). At a functional level, she was unable to walk even with maximum assistance (FIM score 1). Watch the video here. Therapy sessions lasted 45 minutes each (massage 30 minutes). Physical therapy was scheduled every day from Monday to Friday, occupational therapy, massage, speech therapy and cognitive therapy 1-3 sessions per week each. Lokomat therapy was additional to physical therapy and was scheduled 2-3 times per week. Massage sessions were provided to help improve sensation on the right-side extremities and to relax the patient. Lokomat therapy consisted of 37 sessions of 45 minutes. Effective walking time ranged from 5 min. 47 sec. in the first session (due to measuring cuffs and leg length, assessment with L-FORCE, and the patient’s low cognitive state which required a lot of explanation) to up to 30 min. 8sec. After the rehabilitation period, the patient function improved significantly. She was able to walk 50 m with an elbow crutch and moderate assistance with verbal cueing. She was also able to go up and down some steps with moderate assistance of a physical therapist (see video here). We observed an improvement in functional independence reaching a score of 59 FIM points (moderate impairment) at discharge. After rehabilitation, she could independently eat, and only required supervision for grooming and dressing activities. Moreover, she was able to transfer from the wheelchair with minimal assistance. The combination of Lokomat with conventional therapy is feasible in sub-acute severe stroke patients with cognitive deficits. This four-month rehabilitation program helped the patient to improve her functionality as well as the muscle force in knee extensors and hip flexors. The patient was able to walk with moderate assistance at discharge. 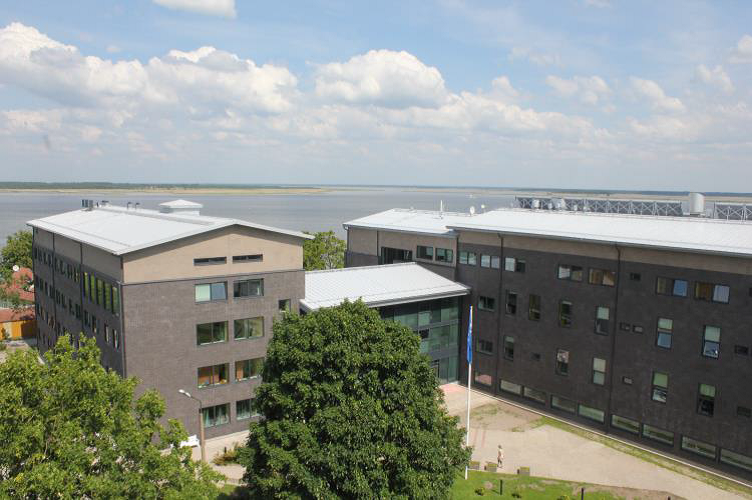 The Haapsalu Neurological Rehabilitation Centre is a modern rehabilitation hospital with over 50 years of experience. It provides services for adults and children with neurological conditions, serving more than 2500 cases per year in a facility with over 1000 m2 for active therapies. Our staff is composed of 138 professionals divided in three teams: spinal cord injury, brain injury and pediatric rehabilitation. Some of them are also involved in developmental units: clinical motion and gait analysis, centre of adaptive aids and rehabilitation laboratory of Centre of Excellence for Health Promotion and Rehabilitation (funded by European Regional Fund) in cooperation with the University of Tallinn. 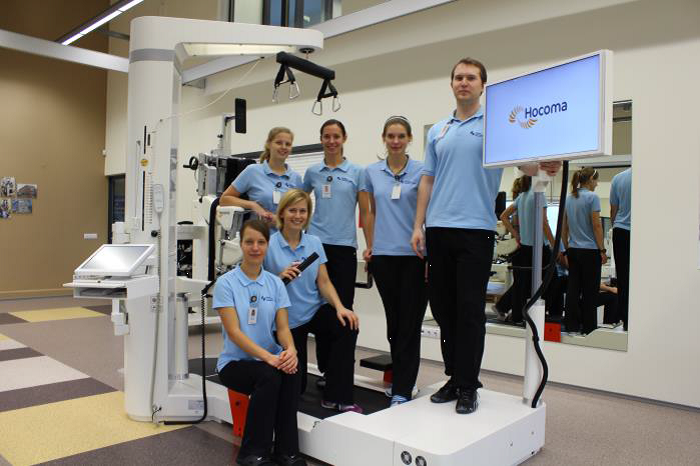 The Centre of Excellence in Health Promotion and Rehabilitation was opened in 2012 and includes several neuro-robotic devices as well as other technologies for neurorehabilitation: LokomatPro, ArmeoSpring, Erigo, E-Link, Biodex isokinetic dynamometer and VO2 max assessment device. Other technologies and devices used in our hospital are: HUR gym with pneumatic resistance equipment, Hologic Horizon for bone densitometry and Monark upper body ergometer for paraplegic patients.